Anna JP in the office has made this really gorgeous Liberty Fleece Sweater. I’m handing over the blog to her today to tell you about her ‘sew’. There have been rolls of fleece, jersey, swimwear and other interesting fabrics in the corner of the studio for a long while. Every time I passed them I’d wonder what I could make that might suit these fabric textures better than tana lawn. Although tana is lovely, its not very warm so I was really interested in something heavier weight for an autumn/winter creation. 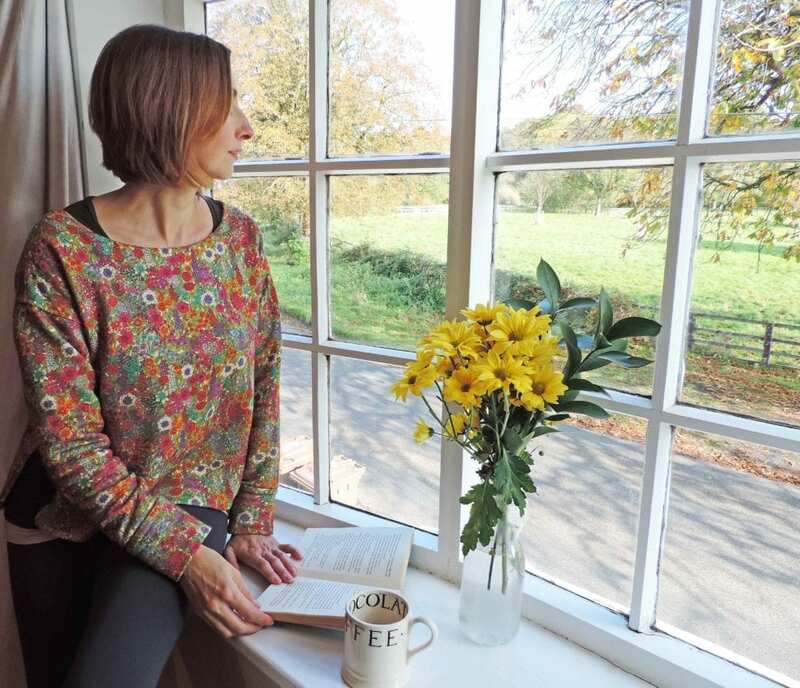 The stretch fleece is ideal for this and I love the pattern and colours of this Ciara print, which looks like a late summer cottage garden. The pattern I chose to make this sweater was Simplicity 8529, which is the licensed version of the hugely popular Sew House Seven “Toaster” sweater. It’s got the exact shape I was looking for, with dropped sleeves, slightly oversized fit, and a longer back than front. Ideal for wearing with leggings or skinny jeans as a casual cosy option. The making-up was incredibly easy. I modified the neck slightly to widen it into a boat neckline (for which I cut my own facing), and did not double-hem the lower edge as it would have been too bulky. I found the original sleeve width at the upper arm to be too wide so I took that in after making, which has improved it greatly. These were all pretty easy modifications to work out, and could be done in advance by comparing pattern pieces with an existing sweater. Fit-wise, I made the S but will probably make the XS next time, with decreased sleeve width and increased sleeve length. For comparison I usually take a UK size 8 in shop-bought clothes. I hope you find some Liberty fleece, jersey, canvas or poplin to make your own off-beat project.